Home » Posts tagged "museums"
Portions of this essay were originally published in the Ackland’s Member E-Newsletter of 13 August 2015. The start of a new academic year is always invigorating, and my thoughts are on the return of our Study Gallery on the second floor, one of the Ackland’s extraordinary programs. Over the course of the academic year, the Study Gallery will contain 36 short-term small exhibitions that accompany curricular teaching happening all across this wonderful University (six new installations reinstalled every six weeks). Originally published in the Ackland’s Member E-Newsletter of 23 December 2014, this is the fifth and final in a series of ruminations on how museums measure success. I write this just as the days are beginning to get longer again and the New Year is in sight — a good moment to think about survival and persistence, the theme of this last reflection on how to think about the success of art museums. The other installments on this topic are now all available on this blog. Originally published in the Ackland’s Member E-Newsletter of 25 November 2014—the Thanksgiving edition—this is the third in a series of ruminations on how museums measure success. The Ackland is currently on track to see a 10% increase this academic year in the number of students and faculty incorporating visits to the Museum into their coursework, compared with last year’s record of 11,121—which itself was a 10% increase over the year before. Originally published in the Ackland’s Member E-Newsletter of 13 November 2014, this is the second in a series of ruminations on how museums measure success. As I sit down to write the second of these musings about museum success, I find myself in Manhattan preparing to visit an exhibition of portraits by Egon Schiele, to which the Ackland has lent its splendid drawing of a woman (right). Indeed, at the moment, Ackland works are in special exhibitions in Essen, Germany; Los Angeles; Princeton, New Jersey; Jackson, Mississippi; and elsewhere. On my desk in Chapel Hill is a letter from the Metropolitan Museum of Art asking to borrow what is perhaps our greatest painting: Valentin de Boulogne’s St. John the Evangelist (below), and I anticipate soon receiving a request to send our Cleopatra and the Peasant by Eugene Delacroix to Minneapolis and London. Originally published in the Ackland’s Member E-Newsletter of 3 November 2014, this is the first in a series of ruminations on how museums measure success. Those who work in and around art museums often turn their minds to the thorny question: how do we measure our success? It is a challenging and stimulating question which can lead off into unexpected avenues. I thought I’d share with you some of my own brief ruminations on this question. I do hope that I hear from you with your comments and ideas on this. Feel free to e-mail me at peter.nisbet@unc.edu — I hope to report on interesting ideas. Collectively, we may come up with some good answers! This semester at the Ackland, I’ve been conducting research and writing interpretative text for the exhibition America Seen: The Hunter and Cathy Allen of Social Realist Prints. Through this process I’ve become very familiar with the prints in the show and wanted to share one as a first impression and in advance of the opening reception this evening. Fritz Eichenberg, American, born in Germany, 1901–1990: Subway (Sleep), 1935; wood engraving. Ackland Art Museum, The Hunter and Cathy Allen Collection, 2013.21.13. America Seen features 38 prints from the mid-1920s to the mid-1940s by American artists. The majority of the artists represented in the exhibition lived and worked in New York City. They were inspired by the scenes of everyday urban life they witnessed around them and the subway was a popular theme. One of my favorites prints, Subway (Sleep), falls into this category. Although the print depicts a rather unremarkable moment in the daily life of any New York City subway rider, I’m drawn into the composition through Eichenberg’s use of strong contrasts between light and dark, as well as his careful attention to realistic details inside the subway car, such as the straps, signage, and advertisements. Fear Not the Blue Border: Mix and Mingle at the Nasher! 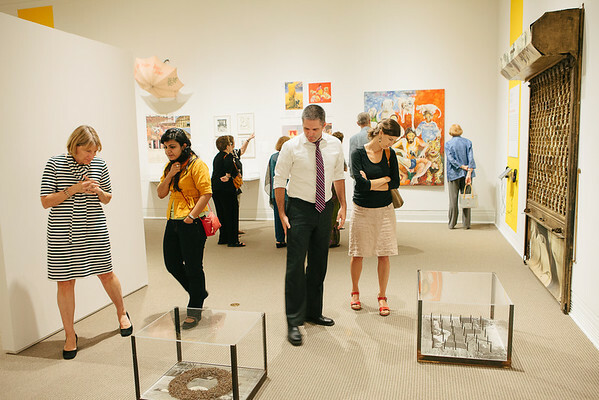 Though Duke University and the University of North Carolina at Chapel Hill have a long-standing rivalry, students are coming together at the universities’ respective art museums to go “beyond blue borders.” Two collaborative parties—designed for students from both universities—are upon us, hosted by two world-class art museums in the Triangle area. Click the image below to see a gallery of photos from the Member Preview and Public Opening Reception for The Sahmat Collective: Art and Activism in India since 1989.